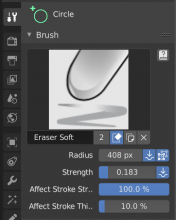 If you first select the Erase tool and then switch to the Primitive tools, you'll only have access to erase brushes. William Reynish (billreynish) assigned this task to Antonio Vazquez (antoniov). William Reynish (billreynish) renamed this task from Grease Pencil Primitive tools show wrong brushes to Grease Pencil Primitive tools show wrong brushes after using Erase tool. Not sure I know how to fix it... @Campbell Barton (campbellbarton) Can you help here? More or less the same issue exists with the Cutter tool, which doesn't use brushes. But in the Tool Properties, it still shows brush settings. Probably the fix is similar to T62223. Might also be similar to T62726. There are quite a number of cases where the Tool Properties show the wrong things. It seems to me that we should probably de-duplicate the logic here, so we don't have to find and display all the correct items separately for the top bar and Tool Properties. Sebastian Parborg (zeddb) reassigned this task from Antonio Vazquez (antoniov) to Campbell Barton (campbellbarton). Sebastian Parborg (zeddb) added a subscriber: Antonio Vazquez (antoniov).